If you listened to the media, most people would have thought 2010 was a crazy time to start a new venture. Company founders Mike Womack and Chris Gummere believed just the opposite. Oklahoma has historically been a leader in the oil and gas and aircraft industries. There are also large markets in the green energy, heavy equipment, agricultural, power and transmission, and military manufacturing sectors. Chris and Mike knew many of these markets were experiencing tremendous growth in the international sector, and they saw a need for crating and packaging in the industrial environment that was not being serviced. Mike’s background in the oil and gas industry gave him first hand experience about the crating needs in the energy sector, and Chris had spent several years in manufacturing before entering the transportation industry. While in transportation, Chris spent many years learning from his customers that many products are made right here in Oklahoma. Although there are many different products manufactured in Oklahoma, they all have one thing in common: packing and transportation. No matter where or what customers shipped, if it wasn’t packed well it didn’t arrive in good condition. Inadequate packing is the single largest reason for damaged goods in transit. 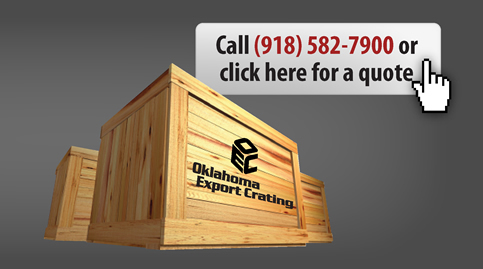 Oklahoma Export Crating puts years of experience to work packing your product to withstand the dangers of transit.